Photo of Cyrene by MM. 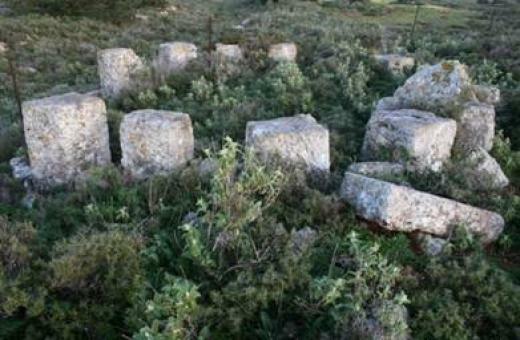 This ancient necropolis is one of the most important in the world. Its burial vaults and sarcophagi were built in about 600 B.C. These tombs are spread out on each side of a road that leads to the centre of the ancient city of Cyrene. The site was damaged along about two kilometres. About 200 vaults and tombs were destroyed, as well as a section of a viaduct that dates back to approximately 200 A.D. Ancient artefacts were thrown into a nearby river as if they were mere rubbish.An excavator at work in late July. 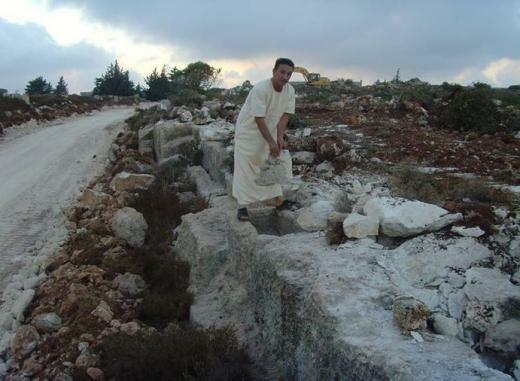 Our Observer inspecting tombs destroyed in July 2013. In Libya, customs and practices tend to carry more weight than the written law. This land traditionally belongs to families who live in nearby farms. They have no official documents that prove that they own the land, yet their claims are not contested. Under Muammar Gaddafi, these families did not dare try to act on these claims. But now, they have transformed the archaeological site into a construction zone. They plan on selling the land in parcels of 500 square metres to real estate developers and private individuals. The latter will be able to build homes and shops. Since these tracts of land are sold without any official documents, they go for very cheap prices, such as 15,000 dinars [about 8,900 euros] per tract. However, it is well known that 500 square metre tracts in this area are valued at about 100,000 dinars [about 59,000 euros], at least when they are sold legally. Part of the demolished viaduct. I have been trying everything to stop this disaster. I appealed, in vain, to the archaeological authorities as well as the local authorities. I contacted one of the brigades in charge of the city’s security, who informed me that they could intervene only if the authorities made an official request, but they haven’t made the slightest move to get involved… I even called the Culture Minister on his mobile phone. I left a message but I haven’t heard anything yet. Farmers marked off 500 square metre tracts in order to sell them. I recently talked with several of the landowners who told me they would stop their project if the state were willing to grant them other land plots in exchange, or compensate them financially. The bad security situation in Libya does not justify this inertia on the part of the authorities. It really isn’t so hard to send a couple officers to block the construction equipment from the necropolis. The circular cemeteries, built in approximately 600 B.C., are some of the oldest of the necropolis. Now, part of this ancient necropolis is forever lost. And the situation is likely to get worse if the government continues to do nothing, because it will encourage other families to destroy cemeteries located on their land.